Gov. Dannel P. Malloy and his transportation commissioner, James P. Redeker. Gov. 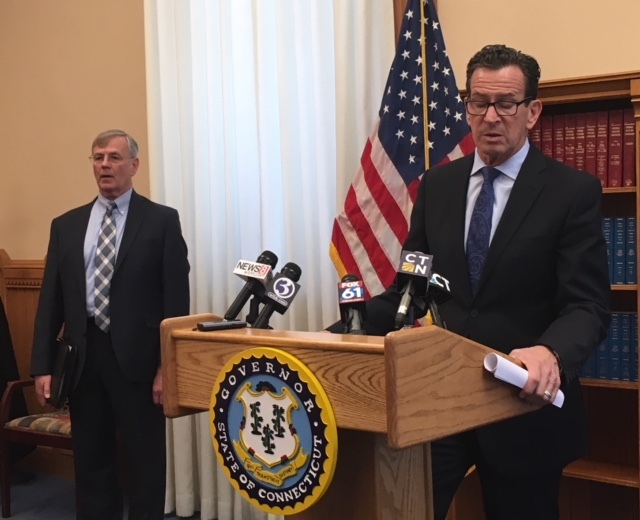 Dannel P. Malloy said Thursday a day of reckoning has arrived for Connecticut’s depleted special transportation fund and the services and projects it finances, outlining what is likely to be an election-year challenge for the General Assembly next year and, perhaps, the last major initiative of a lame-duck governor. With a long hit list of projects and services destined to be shelved without an infusion of revenue, Malloy is attempting to bring a sense of urgency to a legislature that has proven to be remarkably indifferent to a crumbling and underfunded transportation infrastructure over the tenures of a half-dozen governors. Connecticut paid close attention to infrastructure after a section of I-95 collapsed into the Mianus River in Greenwich in 1983, but the neglect resumed as the economy cooled and the state struggled to balance its budget. A 2013 study found that from 1989 to 2008, the state’s highway spending per mile fell 35 percent when adjusted for inflation, the worst drop of any state. Malloy won passage of a measure diverting a half-cent of the sales tax to the transportation fund in 2015, but legislators have balked at bolder moves, rejecting a push by Rep. Tony Guerrera, D-Rocky Hill, the co-chair of the Transportation Committee, to place electronic tolls on the highways. 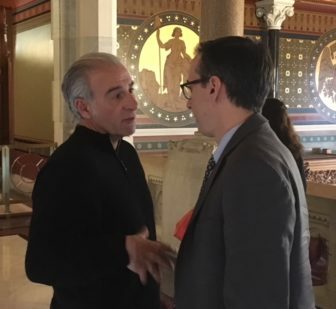 On Thursday, the governor and his transportation commissioner, James P. Redeker, said the revenue crunch means the state could continue to spend $6.2 billion of the current five-year capital plan, but defer as much as $4.3 billion. The cuts would affect projects across the state and also likely force more fare increases in rail and bus service. CT Mirror reported the extent of the problem Wednesday. As Connecticut prepares for a major bond sale next month to finance transportation improvements, projections sent recently to bond-rating agencies show the new state budget won’t prevent the Special Transportation Fund from falling into a series of annual deficits starting in July — or from reaching insolvency by mid-2020. Typically, every dollar in state capital spending on major transportation projects leverages roughly four dollars in matching federal funding. The Department of Transportation estimates that to avert this crisis with revenue alone would require a 14-cents-per-gallon increase in gasoline taxes — at least until tolls could be fully implemented about six years from now. The DOT estimates tolls could raise $700 million annually by about 2024. Guerrera said lawmakers generally shy from controversy in election years, but the revenue shortfall must be addressed by the end of the session in 2018, when all 187 seats in the General Assembly will be up for election. The state’s per-gallon gas tax was cut in 1997, resulting in a cumulative loss of $4 billion since then. In 2012, the legislature capped how much money could be raised by its other fuel tax, an 8.1 percent levy on the wholesale price of gasoline and some other fuels. A further complication was that oil prices fell, as did total miles driven. In the two-year budget passed in 2015, when legislators struggled to balance the budget, $37.5 million was taken from the special transportation fund, resulting in increases in fares for buses and trains and reductions in highway maintenance. Rep. Tony Guerrera, left, talks after the press conference to the governor’s chief of staff, Brian Durand. Malloy called Guerrera a transportation hero, but he declined to back the lawmaker’s campaign for tolls without a constitutional amendment prohibiting the use of toll revenue for anything other than transportation, a “lockbox” in Malloy’s view. The legislature gave final approval in June to a resolution that would place the amendment before voters next fall, a step that makes him more comfortable about a debate next year about tolls and other means of stabilizing the special transportation fund. Malloy said he had no regrets for waiting. Passage of tolls, he said, was not possible without the lockbox, given the state’s history of diverting transportation revenue. Guerrera said legislators, who have been warned for the last two years about the coming shortfall, should be ready for a tolls debate.